Toucans nest in holes in trees. The nest chamber is never lines, but the 2-4 white eggs rest upon a few chips at the bottom, or upon a pebbly bed of regurgitated seeds of various sizes. Parents share incubation and are very impatient sitters. The parents rarely remain for more than an hour and usually leave their eggs uncovered. 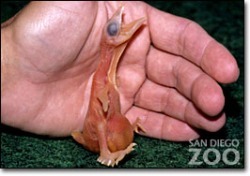 After about 16 days of incubation, the nestling hatch blind and naked. They "toucanets" have no trace of down feathers on their pink skins. The nestlings are fed by both parents with increasing amounts of fruit. The feathers of the small "toucanets" do not begin to expand until they are about 4 weeks old. Parents will care for their young for about 8 weeks, but the "toucanets" sometimes leave when they are about 48 days old.